When I was a wee brat, Mom and Dad were generous with toys. So much so that every so often they'd gather them up, cart off what they felt were excess and "give them away". I learned to hide my favorites, but that wasn't foolproof. I still remember that gunmetal grey 1959 Cadillac car that I had, complete with the tail fins, that was a dealer model. It vanished one day and was never seen again from its hiding place. But we always had toys, mostly creative ones, since those were the ones that held our interest. My Lego bricks, our Lincoln Logs, and that Easy Bake Oven of my sisters were scattered all over the Wreck Room. Yes, Wreck. As in Disaster. The little cakes that Pat made were tasty until we ran out of the mix! I was helping someone Up North decide what he wanted to do for his new toy back around the holidays. Joe needed a new computer. The old desktop machine was over 15 years old and he just couldn't keep it running any more. After false starts such as buying refurb or laptops, we designed a cutting edge desktop computer that was full of compromises that could be changed out later when finances allowed. That was the Old School way of doing it. I have built more desktop computers, repaired them, repurposed them, and recycled them than I care to count. I've repaired laptops, swapped out LCD screens, rebuilt them, and upgraded them as well. Same thing with the iPhones and Androids that I have here. If it's hardware, I'll repair or fix it. When I throw it out, trust me, it's dead, Jim. Despite desktop computers being hard to justify and even harder to justify building from scratch, that was exactly what he did. To thank me, he sent me a token gift. 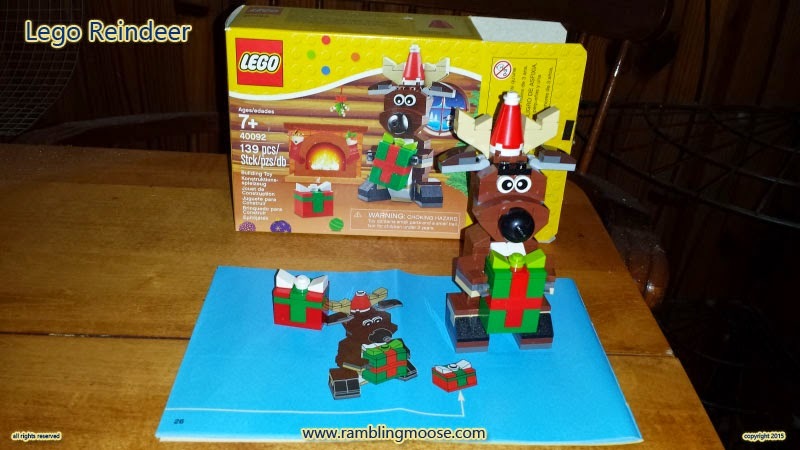 A Lego Reindeer. We called it a Moose anyway, since that really is my nickname, kept from College. I got it, laughed at the comical packaging, and opened the box. It was there that I stopped. There was a book and two bags of random parts. There also was a book. Helpful pictures telling you how to assemble it using as few words as possible. Just numbers and colors and arrows. It didn't help that their black and brown were so close together in tone that it was almost indistinguishable. It gathered dust on the back corner of my dining room table for four months until I got a quiet Saturday Afternoon and an empty house. Empty as in I was the only human. Oscar the parrot was obsessing over the food I had at lunch and Rack the Superdog (TM) was sniffing around for that last spare cube of pork I always save for him when I have some. "Here Boy, that's it, now go on!" As he chewed up that bit of Char Siu Pork and padded from the room. Oscar kept saying Hello over and over. I looked at the book and thought "I'm glad it's ages 7 to Adult. Now, where can I borrow a kid?". Then I thought better of it. If I could repair the broken screen in an iPhone, I surely could snap together a pile of 139 plastic bricks and a few extras, I hoped. It made Ikea instructions look like War and Peace! Getting through a couple assemblies Rack started alerting as the door slammed outside. Kevin came in. "Oh, you're finally starting on that Moose! Need help?" "Yeah, you have a kid around? It's ages 7 to Adult and this adult thinks it's insane! I used to build Lego structures left and right when I was small but this?" "It sure wasn't like that when we were small" said Kevin as he eyed the tiny little special purpose bricks meant to make a distant relation to a set of antlers. Kevin disappeared laughing and came out bearing a metal Snoopy Lunch Box that rattled. "Here, you're missing a piece!" He tried to place a royal blue "Classic" lego block in the middle of my Moose Mess. "Don't you dare try to leave that here!" I cautioned "It won't fit!" "I think you just need a spare piece!" I looked down at this pile of small pieces, a couple of sub assemblies, I wondered whether I was going to finish it at all. A weird blue peg flew from the table onto the floor. Rack went after it and decided it smelled like plastic and not tasty. "Here, I'll get it for you, and here's a second one you dropped". A white block joined it on the table. After inspecting it closely to make sure it wasn't a Classic block, I sent Kevin from the room. "Don't you need to add salt to the pool or something? Go cut the grass! Annoying thing!" "Oh yeah, let me go test the pool, I'll be right back." He sets the Snoopy Lunch Box on the table near, but not on top of my collection of Moose Legos. I went back to assembling sub assemblies. Got the torso done before he came back into the house. "I'll be back later, I need salt"
"I'll say you do, just take this with you!" I rattled the box of Classic blocks. "Are you sure you have enough pieces?" "No, but these won't help!" I really wasn't sure. Turns out that I was short one brown block and had one black block extra. Both were these strange coin thickness squares. I didn't discover that I was missing a brown block until I went to do the final assembly of my Moose's Head. As a result of helping Joe, I have a Moose with a unibrow. There's a black line above the eyes. It looks like eyebrows. Of course I put the eyes in crossed. It made me go crosseyed as well, so it fits. The moral of this story? Got Legos, then Get a Kid to do it for you. Those strange special purpose bricks won't go anywhere else. It's a special purpose set only to build one thing. In this case, a Moose. I now am the proud owner of a blocky plastic Reindeer Moose looking thing and a few oddball random blocks. Perfect to scatter on the floor so barefoot people can find them for me! "Oh I lost that a while back! Thanks for finding it!" As they collapse in pain on my living room floor.